It’s time to truly enjoy the Grand Lake lifestyle! Check out this Langley Bluff home located at 36920 Cliff Crest Drive. Now available for you is a newer built home in Cliff Crest Addition with panoramic views of South Grand Lake as far as the eyes can see. There are more pictures of this Langley Bluff beauty below. Or, just call Roger Bond for more information at (918) 231-9973. Roger Bond, McGraw Realtors, specializing in Grand Lake homes. You are just minutes away from Reasor’s, shopping and banking. 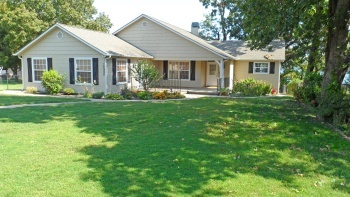 Plus, this truly is one of the closest homes to Tulsa on Grand Lake. Many places advertise that, but this place truly is only an hour from almost anyplace in Tulsa. Since the owner transferred this beautiful Grand Lake home must sell. All offers will be seriously considered. Check it out at MLS # 12-2381 and call Roger Bond for details. Tremendous value offered at $395,000. Contact Roger Bond with McGraw Realtors for more details. Call (918) 231-9973 or Email Roger or just visit his website at Grand Lake Homes Online. Looking out to the lakeside deck. You can literally see over 8 miles up Grand Lake! PreviousAnother Awesome Grand Lake Day Break!